Synopsis: As a former mental institution patient moves back in with his parents and seeks to make amends and rebuild his life, he comes into contact with a woman who has also been battling her own problems. Review: You would think that if you were about to sit down and watch a film about someone having emerged from a mental institution seeking to turn his fortunes around in life, then said film would struggle to find its feet and its voice as a comedy, with very few laughs. Well you couldn’t have been more wrong, because in the capable hands of screenwriter and director David O Russell, adapting from the novel of the same name by Matthew Quick, this romantic comedy packs plenty of heart, drama and unsurprisingly comedy into its 2 hour run time, and it does all this extremely effectively. Pat Solitano (Cooper) is a man who has just come out of a mental institution after seeing his marriage hit the rocks and fall apart. But after his release, he is looking up, and feeling confident of making amends and moving forward. This is until he meets Tiffany (Jennifer Lawrence) a woman who is going through her own set of problems. When she comes onto the scene, things begin to take an interesting turn as these two begin to realise that they have a lot more in common than they care to think. After the success that was his 2010 film, The Fighter, a film with a tremendously strong cast, Russell again manages to put together another very strong cast all of whom excel in their roles. You have Robert DeNiro and Jacki Weaver as Pat’s wacky parents who are doing their best to help Pat rebuild his life, with a surprisingly funny and effective performance from Chris Tucker too. Yet, it is the performances of our two leaders in Cooper and Lawrence that truly steal the show. Their chemistry together is electric to watch and they have more than a few very memorable scenes together, with one scene in a diner standing out by far among many terrific scenes. The film became the first film since 1981 to secure nominations in all four acting categories, and was the first since 2004’s Million Dollar Baby to be nominated for the Big Five Oscars. Lawrence was the only one to secure a trophy, and to be fair, she is the true star of the show. She manages to blend crazy antics and real heart and emotion into her performance. All of the performances are of such a very high standard, you could almost think that you weren’t actually watching a film, but real life instead. In the same year that she shot to stardom with The Hunger Games, Lawrence proved to the world that she is a force to be reckoned with, something that she is still demonstrating today. While Cooper didn’t take home the statue, his work was equally electrifying, and arguably to this day ranks as a career best performance. If it had not been for a sublime performance from Daniel Day Lewis in Lincoln, he might have won a statue himself. The screenplay by Russell is equally terrific. Of course there are some dark moments that goes without saying, but there are plenty of funny and dramatic moments as well, and they all work. He manages to fuse all of these elements into the story very successfully and the story is very compelling to watch. There are highs but there are plenty of very low lows and you feel for all of the characters, as they are extremely well developed. 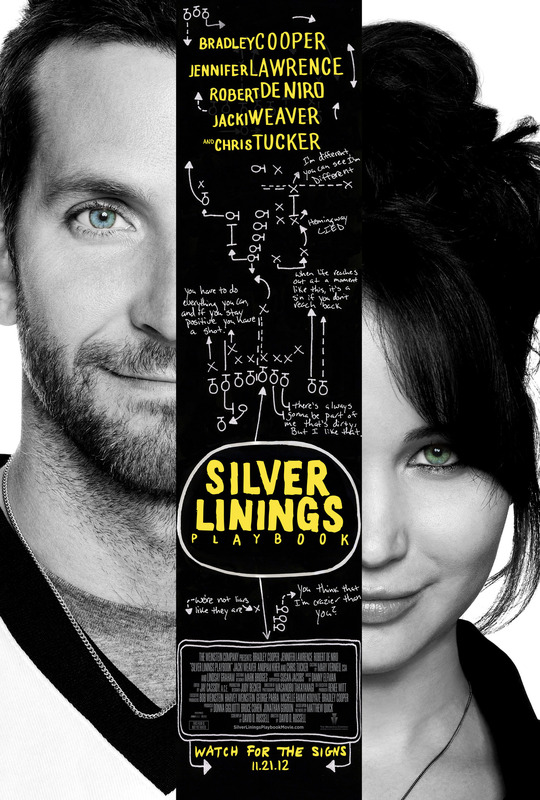 But as the film makes a lot of effort to point out, every cloud has a silver lining, and in the case of this film, that silver lining is despite the somewhat dark subject matter, it produced one hell of a good movie that’s extremely entertaining to watch, and definitely ranks as one of Russell’s best movies. Acted to perfection, with star performances from Cooper and especially Lawrence, with a terrific screenplay that packs heart and comedy aplenty.